Game 4 of the 1903 World Series at Exposition Park. Exposition Park was the name given to three historic stadiums, located in what is today Pittsburgh, Pennsylvania. The fields were used mainly for professional baseball and American football from c. 1879 to c. 1915. The ballparks were initially located on the north side of the Allegheny River in Allegheny City, Pennsylvania. The city was annexed into Pittsburgh in 1907, which became the city's North Side, located across from Pittsburgh's downtown area. Due to flooding from the nearby river, the three stadiums' exact locations varied somewhat. The final version of the ballpark was between the eventual sites of Three Rivers Stadium and PNC Park. In 1903, the third incarnation of Exposition Park was the first National League ballpark to host a World Series game. The Western University of Pennsylvania (WUP)—known today as the University of Pittsburgh—played home football games at Exposition Park, and also used the park as a home field for the university's baseball team. Named for other "expositions" that would be shown there, including horse racing and circuses, Exposition Park I was the first venue in Pittsburgh that hosted baseball. 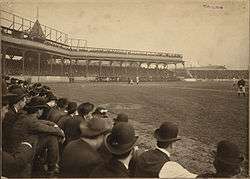 In 1882, the Pittsburgh Pirates—then known simply as Allegheny, or informally as "the Alleghenys"—began play at Exposition Park as a member of the American Association; however, after one season a fire and flooding of the field from the nearby River forced a second park to be built. Despite its reason for construction Exposition Park II was built closer to the River. The Alleghenys played at the second incarnation of the park until they moved to Recreation Park in 1884, which was several blocks north and out of the flood plain. While the Pittsburg Pirates were playing home games at Recreation Park, owners John Beemer and M. B. Lennon of the Pittsburgh Burghers constructed a baseball park near the former site of Exposition Park I and II, which was approximately two blocks west of where PNC Park sits today. Exposition Park III included a roofed wooden grandstand around the infield, and open bleacher sections extending to the right and left field corners. Total capacity was about 10,000 spectators. The seats faced the Allegheny River and the Point. The Burghers played at the stadium during the 1890 Players' League season— both the team and league's only season in existence. On June 10, 1890, Jocko Fields of the Pittsburgh Burghers hit the first home run at Exposition Park III. The Pittsburg Pirates moved to Exposition Park the following season. On April 24, 1891, Fred Carroll hit the first home run by a Pirate in the stadium. Under the management of Fred Clarke the Pirates won the National League pennant in 1901, 1902, and 1903. After the 1903 season, Dreyfuss and Boston Americans owner Henry Killilea organized a best of nine game series to match the two pennant winners against each other. The first World Series held three games in Boston before moving to Exposition Park with the Pirates leading the series 2–1. On October 6, 1903, 7,600 people attended the first World Series game in a National League stadium—the Pirates won by one run. The following day 12,000 people attended the game, forcing some spectators to stand behind a rope in the outfield. The Pirates lost three of four games at Exposition Park and eventually the Series. 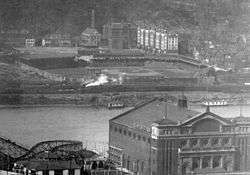 In 1906, the Pirates were the first baseball team to cover their field with a tarp during inclement weather, and though the field was kept dry from the rain, the Allegheny River still caused problems. Flooding sometimes covered the entire outfield with inches of standing water, causing ground rules that gave any ground ball hit into the outfield an automatic single. In 1907, Pittsburg's pitcher Nick Maddox threw a no-hitter at Exposition Park. In 1908, due to the large amounts of people that attended Pirates games, team owner Barney Dreyfuss began looking for a location to construct a new Pirates stadium. The final Pirates game at Exposition Park was played against the Chicago Cubs on June 24, 1909. The Pirates won the game 8–1 in front of 5,545 people, with George Gibson achieving the final National League hit in the ballpark. The very next day, the Pirates once again played the Cubs as the team opened Forbes Field. The Pittsburgh Filipinos called Exposition Park their home in 1912. The Filipinos lasted just over a month after folding with the United States Baseball League. In 1914, the Pittsburgh Stogies began play at Exposition Park. In 1915, the team, renamed the Pittsburgh Rebels, despite improving from the previous season, disbanded due to financial loss with the entire Federal League. Exposition Park continued to host Semi-professional baseball games, as well as other events, but "was eventually razed". The Western University of Pennsylvania (WUP), which would later be known as the University of Pittsburgh, played its first official game at Exposition Park on October 11, 1890 when Shadyside Academy failed to show up for their game with the Allegheny Athletic Association. The Allegheny A.A. made a call to WUP team founder Bert Smyers to bring the WUP team to the park as a replacement. The WUP team was subsequently defeated 38-0. The WUP football team began playing games more regularly at Exposition Park around 1900, occasionally playing in other local venues. Prior to the 1903 season, Arthur Mosse was recruited from the University of Kansas to become the team's new coach. In addition to players that Mosse brought with him, WUP also recruited players from Geneva College to play on the team. Mosse's first season was a disappointment as the WUP football team went 0–8–1 and supporters of the team disbanded leaving the team $500 in debt. George Hubbard Clapp then organized a voluntary $5 "athletic fee" to be paid by students in order to allow the debt to be repaid and the school's football team to play home games at Exposition Park during the next season in order to give the WUP team a more permanent and stable home. Mosse and university officials then obtained a lease to play at Exposition Park during the fall from Pirates owner Barney Dreyfuss for 20% of the admission fee. The 1904 WUP team, the first full season in which WUP played at Exposition Park, saw WUP achieve a remarkable turnaround that included a 10–0 record in which they outscored opponents 407 to 5 and finished second in the state behind the University of Pennsylvania. Prior to home games at Exposition Park, WUP students would organize parades through downtown streets prior to marching across a bridge to the game. A gong, used to announce the beginning of Pirates games, was also sounded prior to the opening kickoff of WUP football contests. After parts of 62 seasons in the Oakland district, baseball and football returned to the north side of the Allegheny River when Three Rivers Stadium opened. The site of the final incarnation of Exposition Park, relative to Three Rivers and the later PNC Park, was in between the two venues. Exposition Park had been on the southwest corner of South Avenue (later Robinson) to the north (first base) and School Street (later Scotland) to the east (third base). To the south (left field) was some open space and railroad tracks and the Allegheny. To the west (right field) was some open space and then Grant Street (later Galveston). That open space would eventually be the site of Three Rivers. Therefore, the site of Exposition Park was the northeast corner of the parking lot east of Three Rivers. In 1995, members of the Society for American Baseball Research placed a plaque where home plate is believed to have been located, in honor of one of the two sites of the first World Series (the other being in Boston). In 1998, a Pennsylvania Historical marker was placed at the site of the park. Interstate 279 currently runs over portions of the site of Exposition Park just before crossing the Allegheny River along the Fort Duquesne Bridge. 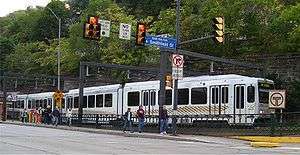 Wikimedia Commons has media related to Exposition Park (Pittsburgh). ↑ In 1891 the United States Board on Geographic Names forced the city of Pittsburgh to undergo a controversial name change by having them drop the "h" at the end of the name, making the team's official name the "Pittsburg Pirates" from the adoption of the Pirates nickname until Pittsburgh was able to get the "h" restored to its name in 1911. ↑ "Top 5 Sports Stories". Huffington Post. 6 May 2010. Finoli, David; Ranier, Bill (2003). The Pittsburgh Pirates Encyclopedia. Sports Publishing LLC. ISBN 978-1-58261-416-8.